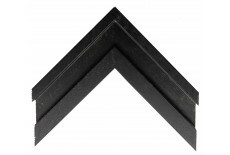 Flagship Framing hold a wide range of moulding profiles and finishes in stock allowing us to deliver quickly and meet your short notice framing requirements. Order picture framing online via our new Online Shop. Browse our range of moulding profiles and finishes before ordering safely and securely. Flagship Framing are now operating from a new warehouse in Leeds. Visit us to view our range of mouldings and even collect in stock items. Flagship Framing provides high quality framing products direct from the manufacturers to Art Distributors and Picture Framers. We also aim to provide the best service in the industry with accurate stock availability and fast reliable delivery. Large 73mm trough shaped moulding finished in an open grain black painted finish. Part of the Loxley collection. 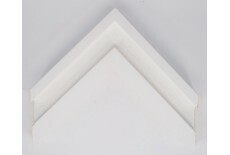 Large 73mm trough shaped moulding finished in an open grain white painted finish. Part of the Loxley collection. Large 73mm trough shaped moulding finished in an open grain green/grey chalky interior designer paint finish. Part of the Hebden collection. Markestil are one of the leading exporters in the industry supplying moulding to over 38 countries worldwide. With an in-house moulding design team, a commitment to excellence and high standards of quality control their aim is to combine traditional craftsmanship with new technology. 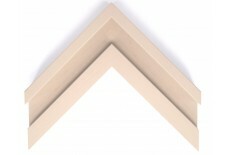 QWM provide our customers with the best value in wooden picture frame mouldings. We aim to be the leader in those segments of the market in which we choose to operate, by tailoring our products to meet identified needs & by providing consistently high quality, at competitive prices. Farne Group operates worldwide through their own stores and exclusive distributors. Due to their worldwide market Farne produce moulding to suit almost any taste and style. 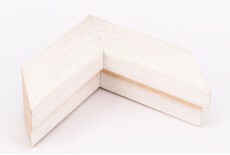 Many mouldings are available in small minimum quantities providing an opportunity for framers to access unique mouldings. We bought Artco (Leeds) Ltd in April 2015, and from the outset Alex and the staff at Flagship Framing have been great with their service, help and advise, and prompt delivery.It's great to know that if the moulding we require is in stock, we can order it and have it with us in the workshop within days, or with some orders within hours". Jackie Watson - Director at Artco (Leeds) Ltd.
I’ve found Flagship framing to have some unique framing profiles and finishes that many of our customers are being drawn to on our chevron boards. When it comes to ordering and delivering the mouldings the Flagship personnel can not do enough to help, often going the extra mile to hit tight deadlines and meet our demands. It’s a pleasure to do business with this Company. If you have a question or would like to request our services, please don’t hesitate to make an enquiry. Copyright 2017 Flagship Framing. All Rights Reserved.